Being called into her on again, off again boyfriend/bosses office and being told she had lost her job was the last thing Nell expected. Heart broken, from the betrayal of ex Aidan, when she thought they may get back together and unemployed Nell embarks on a trip across the Atlantic ocean, using the last of her wages to see her cousin and maybe live them dreams. This is the first novel I've read by Miranda Dickinson and I was impressed. The book starts off a little grim, heartbroken, unemployed, having to move out of the shared house back to her parents. 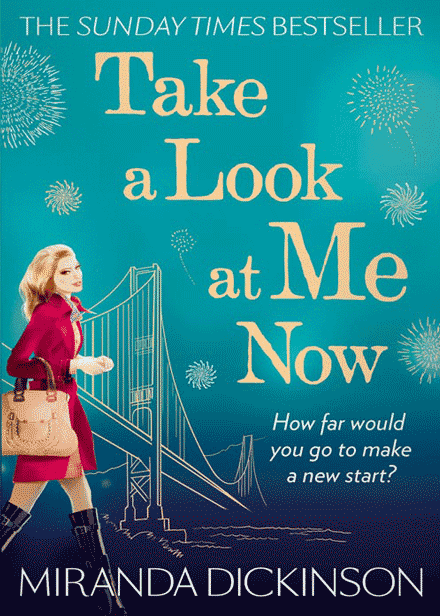 Once in San Fransisco, worrying goes out the window and Nell really starts to live and think about her dream, though the novel seems a little bit too perfect throughout, it still is an enjoyable read and page turning, mainly a typical romantic, live your dream and succeed novel. If your on a diet don't read this book, some of the descriptions throughout will have you watering at the mouth. Score 4/5. I want to read more by Miranda Dickinson. Check out this months advertisers - Jelly Bean home deco & gifts here, Georgina at Georgina Does fashion, lifestyle & beauty blog here. Mollie from The Fashion of Craft here and The Life & Loves of a Nine Grand Student here.